Sakoku(鎖国, "closed country") was the isolationist foreign policy of the Japanese Tokugawa shogunate (aka Bakufu)  under which relations and trade between Japan and other countries were severely limited, nearly all foreign nationals were barred from entering Japan and common Japanese people were kept from leaving the country for a period of over 220 years. 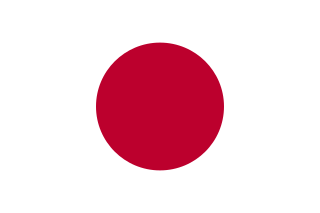 The policy was enacted by the Tokugawa shogunate under Tokugawa Iemitsu through a number of edicts and policies from 1633 to 1639, and ended after 1853 when the American Black Ships commanded by Matthew Perry forced the opening of Japan to American (and, by extension, Western) trade through a series of unequal treaties. It was preceded by a period of largely unrestricted trade and widespread piracy when Japanese mariners travelled Asia and official embassies and envoys visited both Asian states, New Spain (now Mexico), and Europe. This period was also noted for the large number of foreign traders and pirates who were resident in Japan and active in Japanese waters. Engelbert Kaempfer was a German naturalist, physician, and explorer writer known for his tour of Russia, Persia, India, South-East Asia, and Japan between 1683 and 1693. Japan was not completely isolated under the sakoku policy. It was a system in which strict regulations were applied to commerce and foreign relations by the shogunate and by certain feudal domains ( han ). There was extensive trade with China through the port of Nagasaki, in the far west of Japan, with a residential area for the Chinese. The policy stated that the only European influence permitted was the Dutch factory at Dejima in Nagasaki. Western scientific, technical and medical innovations did flow into Japan through Rangaku ("Dutch learning"). Trade with Korea was limited to the Tsushima Domain (today part of Nagasaki Prefecture). Trade with the Ainu people was limited to the Matsumae Domain in Hokkaidō, and trade with the Ryūkyū Kingdom took place in Satsuma Domain (present-day Kagoshima Prefecture). Apart from these direct commercial contacts in peripheral provinces, trading countries sent regular missions to the shōgun in Edo and Osaka Castle. Many items traded from Japan to Korea and the Ryūkyū Kingdom were eventually shipped on to China. In the Ryūkyū Islands and Korea, the clans in charge of trade built trading towns outside Japanese territory where commerce actually took place. Due to the necessity for Japanese subjects to travel to and from these trading posts, this resembled something of an outgoing trade, with Japanese subjects making regular contact with foreign traders in essentially extraterritorial land. Commerce with Chinese and Dutch traders in Nagasaki took place on an island called Dejima, separated from the city by a narrow strait; foreigners could not enter Nagasaki from Dejima, nor could Japanese enter Dejima without special permission or authorization. Dejima was a Dutch trading post located in Nagasaki, Japan from 1641 to 1854. The Haijin or sea ban was a series of related isolationist Chinese policies restricting private maritime trading and coastal settlement during most of the Ming dynasty and some of the Qing. First imposed to deal with Japanese piracy amid the mopping up of Yuan partisans, the sea ban was completely counterproductive: by the 16th century, piracy and smuggling were endemic and mostly consisted of Chinese who had been dispossessed by the policy. China's foreign trade was limited to irregular and expensive tribute missions, and resistance even to them among the Chinese bureaucracy led to the scrapping of Zheng He's fleets. Piracy dropped to negligible levels only upon the end of the policy in 1567, but a modified form was subsequently adopted by the Qing. 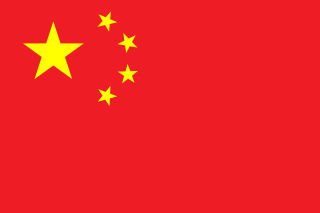 This produced the Canton System of the Thirteen Factories, but also the opium smuggling that led to disastrous wars with Britain and other European powers in the 19th century. Text from the seclusion edict of 1636: "No Japanese ship ... nor any native of Japan, shall presume to go out of the country; whoever acts contrary to this, shall die, and the ship with the crew and goods aboard shall be sequestered until further orders. All persons who return from abroad shall be put to death. Whoever discovers a Christian priest shall have a reward of 400 to 500 sheets of silver and for every Christian in proportion. All Namban (Portuguese and Spanish) who propagate the doctrine of the Catholics, or bear this scandalous name, shall be imprisoned in the Onra, or common jail of the town. The whole race of the Portuguese with their mothers, nurses and whatever belongs to them, shall be banished to Macao. Whoever presumes to bring a letter from abroad, or to return after he hath been banished, shall die with his family; also whoever presumes to intercede for him, shall be put to death. No nobleman nor any soldier shall be suffered to purchase anything from the foreigner." It is conventionally regarded that the shogunate imposed and enforced the sakoku policy in order to remove the colonial and religious influence of primarily Spain and Portugal, which were perceived as posing a threat to the stability of the shogunate and to peace in the archipelago. The increasing number of Catholic converts in southern Japan (mainly Kyūshū) was a significant element of that which was seen as a threat. Based on work conducted by Japanese historians in the 1970s, some scholars have challenged this view, believing it to be only a partial explanation of political reality. The motivations for the gradual strengthening of the maritime prohibitions during the early 17th century should be considered within the context of the Tokugawa bakufu's domestic agenda. One element of this agenda was to acquire sufficient control over Japan's foreign policy so as not only to guarantee social peace, but also to maintain Tokugawa supremacy over the other powerful lords in the country, particularly the tozama daimyōs . These daimyōs had used East Asian trading linkages to profitable effect during the Sengoku period, which allowed them to build up their military strength as well. By restricting the daimyōs' ability to trade with foreign ships coming to Japan or pursue trade opportunities overseas, the Tokugawa bakufu could ensure none would become powerful enough to challenge the bakufu's supremacy. This is consistent with the generally agreed rationale for the Tokugawa bakufu's implementation of the system of alternate attendance, or sankin-kōtai . Nevertheless, Christianity and the two colonial powers it was most strongly associated with, were seen as genuine threats by the Tokugawa bakufu. Once the remnants of the Toyotomi clan had been defeated in 1615, Tokugawa Hidetada turned his attention to the sole remaining credible challenge to Tokugawa supremacy. Religious challenges to central authority were taken seriously by the bakufu as ecclesiastical challenges by armed Buddhist monks were common during the sengoku period. The Empress Meishō (1624–96) also had grave doubts when she heard about how the Spanish and Portuguese were settling in the New World, and thought that Japan would soon become one of the many countries in their possession. Protestant English and Dutch traders reinforced this perception by accusing the Spanish and Portuguese missionaries of spreading the religion systematically, as part of a claimed policy of culturally dominating and colonizing Asian countries. The Dutch and English were generally seen by the Japanese to be able to separate religion and trade, while their Iberian counterparts were looked upon with much suspicion. The Dutch, eager to take over trade from the Spanish and Portuguese, had no problems reinforcing this view. The number of Christians in Japan had been steadily rising due to the efforts of missionaries, such as Francis Xavier and daimyō converts. The direct trigger which is said to have spurred the imposition of sakoku was the Shimabara Rebellion of 1637–38, an uprising of 40,000 mostly Christian peasants. In the aftermath, the shogunate accused missionaries of instigating the rebellion, expelled them from the country, and strictly banned the religion on penalty of death. The remaining Japanese Christians, mostly in Nagasaki, formed underground communities and came to be called Kakure Kirishitan. All contact with the outside world became strictly regulated by the shogunate, or by the domains (Tsushima, Matsumae, and Satsuma) assigned to the task. Dutch traders were permitted to continue commerce in Japan only by agreeing not to engage in missionary activities. Today, the Christian percentage of the population (1%) in Japan remains far lower than in other East Asian countries such as China (3%), Vietnam (7%), South Korea (29%)  and the Philippines (over 90%). The sakoku policy was also a way of controlling commerce between Japan and other nations, as well as asserting its new place in the East Asian hierarchy. The Tokugawa had set out to create their own small-scale international system where Japan could continue to access the trade in essential commodities such as medicines, and gain access to essential intelligence about happenings in China, while avoiding having to agree to a subordinate status within the Chinese tributary system. Japan's generally constructive official diplomatic relationship with Joseon Korea allowed regular embassies ( Tongsinsa ) to be dispatched by Korea to Japan. Together with the brisk trade between Tsushima and Korea, as well as the presence of Japanese in Pusan, Japan was able to access Chinese cultural, intellectual and technological developments throughout the Edo period. At the time of the promulgation of the strictest versions of the maritime prohibitions, the Ming dynasty had lost control of much of China and it was unnecessary, and perhaps undesirable, for Japan to pursue official diplomatic relations with either of the Ming or the Qing governments while the issue of imperial legitimacy was unsettled. Japan was able to acquire the imported goods it required through intermediary trade with the Dutch and through the Ryukyu Islands. The Japanese actually encouraged the Ryūkyū Kingdom's rulers to maintain a tributary relationship with China, even though the Shimazu clan had surreptitiously established great political influence in the Ryukyu Islands. The Qing became much more open to trade after it had defeated the Ming loyalists in Taiwan, and thus Japan's rulers felt even less need to establish official relations with China. The way Japan kept abreast of Western technology during this period was by studying medical and other texts in the Dutch language obtained through Dejima. This developed into a blossoming field in the late 18th century which was known as Rangaku (Dutch studies). It became obsolete after the country was opened and the sakoku policy collapsed. Thereafter, many Japanese students (e.g., Kikuchi Dairoku) were sent to study in foreign countries, and many foreign employees were employed in Japan (see o-yatoi gaikokujin ). The policies associated with sakoku ended with the Convention of Kanagawa in response to demands made by Commodore Perry. Many isolated attempts to end Japan's seclusion were made by expanding Western powers during the 17th, 18th and 19th centuries. American, Russian and French ships all attempted to engage in a relationship with Japan but were rejected. In 1778, a merchant from Yakutsk by the name of Pavel Lebedev-Lastochkin arrived in Hokkaidō with a small expedition. He offered gifts, and politely asked to trade in vain. In 1787, Jean-François de Galaup, comte de Lapérouse navigated in Japanese waters. He visited the Ryūkyū islands and the strait between Hokkaidō and Sakhalin, naming it after himself. In 1791, two American ships commanded by the American explorer John Kendrick—the Lady Washington ,  under Captain Kendrick, and the Grace, under Captain William Douglas—stopped for 11 days on Kii Ōshima island, south of the Kii Peninsula. Kendrick was the first known American to have visited Japan. He apparently planted an American flag and claimed the islands, although accounts of his visit in Japan are nonexistent. In 1792 the Russian subject Adam Laxman visited the island of Hokkaido. In 1797 US Captain William Robert Stewart, commissioned by the Dutch from Batavia, took the ship Eliza of New York to Nagasaki, Japan, with a cargo of Dutch trade goods. In 1803, William Robert Stewart returned on board a ship named "The Emperor of Japan" (the captured and renamed "Eliza of New York"), entered Nagasaki harbour and tried in vain to trade through the Dutch enclave of Dejima. In 1804, the Russian expedition around the world led by captain Adam Johann von Krusenstern reached Nagasaki. The Russian envoy Nikolai Rezanov requested trade exchanges. The Bakufu refused the request and the ships had to leave in spring 1805. The Russians attacked Sakhalin and the Kuril islands during the following three years, prompting the Bakufu to build up defences in Ezo. 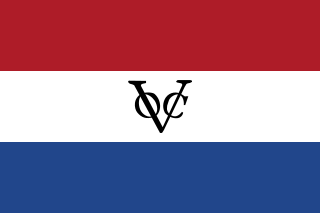 In 1808, the British frigate HMS Phaeton, preying on Dutch shipping in the Pacific, sailed into Nagasaki under a Dutch flag, demanding and obtaining supplies by force of arms. In 1811, the Russian naval lieutenant Vasily Golovnin landed on Kunashiri Island, and was arrested by the Bakufu and imprisoned for 2 years. In 1825, following a proposal by Takahashi Kageyasu (ja:高橋景保), the Bakufu issued an "Order to Drive Away Foreign Ships" (Ikokusen uchiharairei, also known as the "Ninen nashi", or "No second thought" law), ordering coastal authorities to arrest or kill foreigners coming ashore. In 1830, the brig "Cyprus", a ship of Australian convicts who had successfully mutinied against their masters and set sail for Canton, China, arrived on the coast of Shinkoku near the town of Mugi in Tokushima Prefecture. The mutineers were desperately low on water, firewood, and supplies, but were attacked and sent away by the Japanese. This was the first time an Australian ship ever visited Japan. In 1837, an American businessman in Guangzhou named Charles W. King saw an opportunity to open trade by trying to return to Japan three Japanese sailors (among them, Otokichi) who had been shipwrecked a few years before on the coast of Oregon. He went to Uraga Channel with Morrison, an unarmed American merchant ship. The ship was fired upon several times, and finally sailed back unsuccessfully. 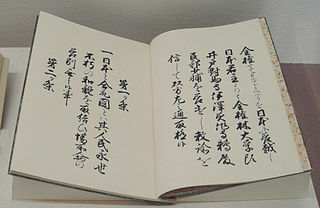 In 1842, following the news of the defeat of China in the Opium War and internal criticism following the Morrison Incident, the Bakufu responded favourably to foreign demands for the right to refuel in Japan by suspending the order to execute foreigners and adopting the "Order for the Provision of Firewood and Water" (Shinsui kyuyorei ja:薪水給与令). In 1844, a French naval expedition under Captain Fornier-Duplan visited Okinawa on April 28, 1844. Trade was denied, but Father Forcade was left behind with a translator. In 1845, whaling ship Manhattan (1843) rescued 22 Japanese shipwrecked sailors. Captain Mercator Cooper was allowed into Edo Bay, where he stayed for four days and met with the Governor of Edo and several high officers representing The Emperor. They were given several presents and allowed to leave unmolested, but told never to return. On July 20, 1846, Commander James Biddle, sent by the United States Government to open trade, anchored in Tokyo Bay with two ships, including one warship armed with 72 cannons, but his demands for a trade agreement remained unsuccessful. In 1848, Half-Scottish/Half-Chinook Ranald MacDonald pretended to be shipwrecked on the island of Rishiri in order to gain access to Japan. He was sent to Nagasaki, where he stayed for 10 months and became the first English teacher in Japan. Upon his return to America, MacDonald made a written declaration to the United States Congress, explaining that the Japanese society was well policed, and the Japanese people well behaved and of the highest standard. In 1848, Captain James Glynn sailed to Nagasaki, leading at last to the first successful negotiation by an American with "Closed Country" Japan. James Glynn recommended to the United States Congress that negotiations to open Japan should be backed up by a demonstration of force, thus paving the way to Perry's expedition. In 1849, the Royal Navy's HMS Mariner entered Uraga Harbour to conduct a topographical survey. Onboard was the Japanese castaway Otokichi, who acted as a translator. To avoid problems with the Japanese authorities, he disguised himself as Chinese, and said that he had learned Japanese from his father, allegedly a businessman who had worked in relation with Nagasaki. In 1853, the Russian embassy of Yevfimy Putyatin arrived in Nagasaki (August 12, 1853). The embassy demonstrated a steam engine, which led to the first recorded attempts at manufacturing a steam engine in Japan, by Hisashige Tanaka in 1853. These largely unsuccessful attempts continued until, on July 8, 1853, Commodore Matthew Perry of the U.S. Navy with four warships: Mississippi, Plymouth, Saratoga, and Susquehanna steamed into the Bay of Edo (Tokyo) and displayed the threatening power of his ships' Paixhans guns. He demanded that Japan open to trade with the West. These ships became known as the kurofune, the Black Ships. 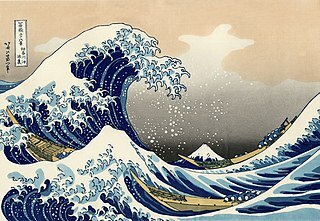 The following year, at the Convention of Kanagawa (March 31, 1854), Perry returned with seven ships and forced the Shogun to sign the "Treaty of Peace and Amity", establishing formal diplomatic relations between Japan and the United States. The United Kingdom signed the Anglo-Japanese Friendship Treaty at the end of 1854. Between 1852 and 1855, Admiral Yevfimiy Putyatin of the Russian Navy made several attempts to obtain from the Shogun favourable trade terms for Russia. In June 1853, he brought to Nagasaki Bay a letter from the Foreign Minister Karl Nesselrode and demonstrated to Tanaka Hisashige a steam engine, probably the first ever seen in Japan. His efforts culminated in the signing of the Treaty of Shimoda in February 1855. Within five years, Japan had signed similar treaties with other western countries. The Harris Treaty was signed with the United States on July 29, 1858. These "Ansei Treaties" were widely regarded by Japanese intellectuals as unequal, having been forced on Japan through gunboat diplomacy, and as a sign of the West's desire to incorporate Japan into the imperialism that had been taking hold of the continent. 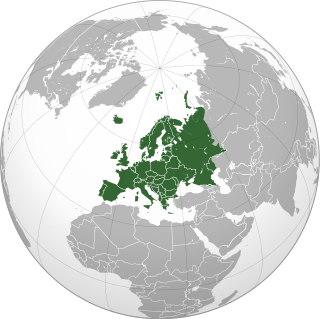 Among other measures, they gave the Western nations unequivocal control of tariffs on imports and the right of extraterritoriality to all their visiting nationals. They would remain a sticking point in Japan's relations with the West up to the turn of the 20th century. Several missions were sent abroad by the Bakufu, in order to learn about Western civilization, revise treaties, and delay the opening of cities and harbour to foreign trade. A Japanese Embassy to the United States was sent in 1860, on board the Kanrin Maru. 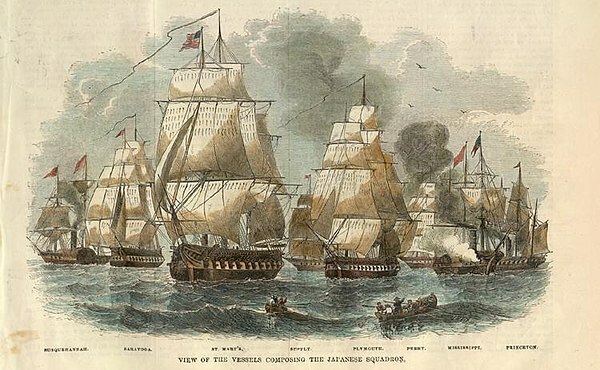 In 1861 in the Tsushima Incident a Russian fleet tried to force open a harbour not officially opened to foreign trade with foreign countries, but was finally repelled with the help of the British. An Embassy to Europe was sent in 1862, and a Second Embassy to Europe in 1863. Japan also sent a delegation and participated to the 1867 World Fair in Paris. Other missions, distinct from those of the Shogunate, were also sent to Europe, such as the Chōshū Five, and missions by the fief of Satsuma. Haijin (海禁) – Maritime restrictions; kaikin in Japanese. On March 31, 1854, the Convention of Kanagawa or Kanagawa Treaty was the first treaty between the United States and the Tokugawa shogunate. The Tokugawa Shogunate, also known as the Tokugawa Bakufu (徳川幕府) and the Edo Bakufu (江戸幕府), was the last feudal Japanese military government, which existed between 1603 and 1867. The head of government was the shōgun, and each was a member of the Tokugawa clan. The Tokugawa shogunate ruled from Edo Castle and the years of the shogunate became known as the Edo period. This time is also called the Tokugawa period or pre-modern. Tokugawa Iemitsu was the third shōgun of the Tokugawa dynasty. He was the eldest son of Tokugawa Hidetada, and the grandson of Tokugawa Ieyasu. Iemitsu ruled from 1623 to 1651, and during this period he crucified Christians, expelled all Europeans from Japan and closed the borders of the country, a foreign politics policy that continued for over 200 years after its institution. It is debatable whether Iemitsu can be considered a kinslayer for making his younger brother Tadanaga commit suicide by seppuku. Iemitsu also had well-known homosexual preferences, and it is speculated he was the last direct male descendant of Tokugawa Ieyasu, thereby ending the patrilineality of the shogunate by the third generation. Hirado, historically known as Firando is a city located in Nagasaki Prefecture, Japan. The part historically named Hirado is located on the Hirado Island. With recent mergers, the city's boundaries have expanded, and Hirado now occupies parts of the main island of Kyushu. The components are connected by the Hirado Bridge. Tokugawa Ietsugu; 徳川 家継 was the seventh shōgun of the Tokugawa dynasty, who ruled from 1713 until his death in 1716. He was the son of Tokugawa Ienobu, thus making him the grandson of Tokugawa Tsunashige, daimyō of Kofu, great-grandson of Tokugawa Iemitsu, great-great grandson of Tokugawa Hidetada, and finally the great-great-great grandson of Tokugawa Ieyasu. The Black Ships was the name given to Western vessels arriving in Japan in the 16th and 19th centuries. The Treaty of Shimoda of February 7, 1855, was the first treaty between the Russian Empire, and the Empire of Japan, then under the administration of the Tokugawa shogunate. Following shortly after the Convention of Kanagawa signed between Japan and the United States, it effectively meant the end of Japan’s 220-year-old policy of national seclusion (sakoku), by opening the ports of Nagasaki, Shimoda and Hakodate to Russian vessels and established the position of Russian consuls in Japan and defined the borders between Japan and Russia. Shōhei Maru (昇平丸) was a Western-style sailing frigate constructed on orders of the Tokugawa shogunate of Bakumatsu period Japan by Satsuma Domain in response to the Perry Expedition and increasing incursions of foreign warships into Japanese territorial waters. She was built from 1853 to 1854 at Sakurajima in what is now Kagoshima Prefecture. Shōhei Maru should not be confused with the World War II passenger/cargo vessel of the same name, sunk by the submarine USS Spadefish off of Korea. Satsuma Domain, officially Kagoshima Domain, was a Japanese domain of the Edo period. It is associated with the provinces of Satsuma, Ōsumi and Hyūga in modern-day Kagoshima Prefecture and Miyazaki Prefecture on the island of Kyūshū. Sō Yoshitoshi was a Sō clan daimyō of the domain of Tsushima on Tsushima Island at the end of Japan's Sengoku period, and into the Edo period. His name is sometimes read as Yoshitomo. Under the influence of Konishi Yukinaga, he was baptized and accepted the name "Dario". He took part in Toyotomi Hideyoshi's invasions of Korea in the 1590s, and led a force in the Siege of Busan. Abe Masahiro was the chief senior councillor (rōjū) in the Tokugawa shogunate of Bakumatsu period Japan at the time of the arrival of Commodore Matthew Perry on his mission to open Japan to the outside world. Abe was instrumental in the eventual signing of the Convention of Kanagawa in 1854, and other unequal treaties shortly afterwards. His courtesy title was Ise-no-kami. Over the course of Japan's Edo period, the Ryūkyū Kingdom sent eighteen missions to Edo, the capital of Tokugawa Japan. The unique pattern of these diplomatic exchanges evolved from models established by the Chinese, but without denoting any predetermined relationship to China or to the Chinese world order. The Kingdom became a vassal to the Japanese feudal domain (han) of Satsuma following Satsuma's 1609 invasion of Ryūkyū, and as such were expected to pay tribute to the shogunate; the missions also served as a great source of prestige for Satsuma, the only han to claim any foreign polity, let alone a kingdom, as its vassal. Sakai bugyō (堺奉行) were officials of the Tokugawa shogunate in Edo period Japan. Appointments to this prominent office were usually fudaidaimyōs. Conventional interpretations have construed these Japanese titles as "commissioner", "overseer" or "governor". Andō Nobumasa was a late-Edo period Japanese samurai, and the 5th daimyō of Iwakitaira Domain in the Tōhoku region of Japan, and the 10th hereditary chieftain of the Andō clan. He was the eldest son of Andō Nobuyori and his mother was a daughter of Matsudaira Nobuakira of Yoshida Domain. His childhood names were Kinnoshin and Kinnosuke and he was known most of his life as Andō Nobuyuki, taking the name of Nobumasa only after he became a rōjū. Fukue Domain, also known as Gotō Domain, was a Japanese domain of the Edo period. It is associated with Hizen Province in modern-day Saga Prefecture. Nagasaki trade coins, also known as Nagasaki export coins refer to Japanese mon coins specifically cast for export by the Tokugawa government between 1659 and 1685 during the Sakoku era. Though the inscriptions on the coins often match Chinese coins from the Song dynasty they’re often cast with different typefaces such as the fact that the Genpō Tsūhō (元豊通寳) produced at Nagasaki was in Clerical script while the Song dynasty’s versions were in Seal script and Running script. Due to the success of these coins they’re often still found in modern day Vietnam and Java, and were copied by contemporary Vietnamese mints as they had become the de facto standard coinage in Vietnam as native production had declined in the 17th century. As the export of gold and silver was banned by the Qing dynasty Japanese merchants were most likely to go to Hanoi and Hội An to gain access to Chinese products causing these coins to start circulating en masse on the Vietnamese market. A special “5 elements” series of Nagasaki trade coins were also cast for export to Taiwan. 1 2 Tashiro, Kazui. "Foreign Relations During the Edo Period: Sakoku Reexamined". Journal of Japanese Studies. Vol. 8, No. 2, Summer 1982. 1 2 Toby, Ronald (1984). State and Diplomacy in Early Modern Japan. Princeton: Princeton University Press. ↑ Toby, Ronald (1977). "Reopening the Question of Sakoku: Diplomacy in the Legitimation of the Tokugawa Bakufu", Journal of Japanese Studies. Seattle: Society for Japanese Studies. 1 2 Hellyer, Robert I. (2009). Defining engagement: Japan and global contexts, 1640–1868. Harvard University. ↑ Laver, Michael S. (2011). The Sakoku Edicts and the Politics of Tokugawa Hegemony. Cambria Press. ↑ Agence France-Presse (2009-01-31). "S. Korea president faces protests from Buddhists". The Straits Times . Archived from the original on 2008-09-04. Retrieved 2009-01-31. ↑ 先島諸島火番盛 [Sakishima Beacons] (in Japanese). Agency for Cultural Affairs . Retrieved 11 June 2012. ↑ Hall, J (1955). Tanuma Okitsugu, 1719–1788, p. 105. ↑ Glynn Barratt. Russia in Pacific Waters, 1715–1825. UBC Press, 1981. ISBN 9780774801171. Pages 35–37. ↑ Ridley, Scott (2010). Morning of Fire: John Kendrick's Daring American Odyssey in the Pacific. HarperCollins. pp. 221–25. ISBN 978-0-06-170012-5 . Retrieved 30 July 2012. ↑ John, Derby. "The Derby Family" (PDF). Peabody Essex Museum. p. 3. Retrieved 15 December 2016. ↑ Asia Society of Japan, Long lecture Archived 2008-03-25 at the Wayback Machine . Hall, John Wesley. (1955) Tanuma Okitsugu: Forerunner of Modern Japan. Cambridge: Harvard University Press. Oshima, Akihide. (2009) Sakoku to iu Gensetsu.（大島明秀『「鎖国」という言説』）Kyoto in Japan: Minerva Publisher. "Numismatist in Commodore Perry's fleet (1853–54)", Journal of Antiques, August 2005 .